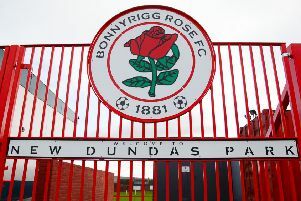 Stand-in Bonnyrigg Rose captain Ewan Moyes says the New Dundas Park men will put their Super League title heartache behind them and give everything in their attempt to lift the East of Scotland Cup. Rose tripped up at the penultimate hurdle on Wednesday night after playing catch up with league leaders Kelty Hearts all season. They had hoped to take all three points against Linlithgow to set up final-day championship face off with Kelty tomorrow, however, losing out 2-0 to Mark Bradley’s side condemned Rose to second place and handed the title to the Fife club. Eleven games in just 31 days had evidently taken its toll on a depleted Rose squad on Wednesday night who looked as if they were running on empty – their exertions in the William Hill Scottish Cup and Junior Cup resulting in a fixture backlog which ultimately proved to be their downfall. Centre back Moyes, who has stepped up to take control of the armband in recent weeks, with skipper Jonny Stewart sidelined until next season with an ankle injury, feels they deserve praise for taking the title down to the wire considering they were more than 20 points behind at one stage. “We are devastated we aren’t taking it to the final game,” said Moyes. “It’s been such an effort that we’ve put in towards the end of the season and it’s just been one game too many. “The chances were there on Wednesday night; it was all us but we just couldn’t put the ball in the net. We were missing a lot of guys as well. We basically had 13 fit players and managed to get a formation to start with. It was just one hurdle too far. We are absolutely gutted, especially the nature of the game as well; we had the chances. Tomorrow’s match at New Central Park would likely have attracted a crowd of close to 1000 had it been a title decider, however, Rose are now just playing for pride with the home side in party mode ahead of being crowned champions at full-time. Moyes is eager to spoil their party though, and ahead of visiting Musselburgh Athletic in the semi-final of the East of Scotland Cup on Wednesday night, stressed their desire to end the season with silverware to have something to show for their efforts. He added: “They’ll be getting crowned champions and we’ll go and put in a fight and want to prove them wrong. We want to win and always go out to win. “We’ll go there and take our punishment – at the end of the day they won the league and were the better team over the course of the season. It’s not going to be easy for us but we’ll hold our heads high and we’ll take our defeat graciously. We’ve still got a cup to play for so the season isn’t over yet. Rose boss Robbie Horn won’t have the luxury of resting players for tomorrow’s match ahead of their midweek semi-final. Stewart, Dean Hoskins and Ruaridh Donaldson – three players who have been a fixture in their success in the last two years – are all out for the remainder of the campaigin. “I don’t know who is going to be fit and who is going to be available,” said Horn. “We just have to see how it goes. It’s so important that we don’t finish the season with nothing. It’s going to be a big job to pick them up for tomorrow and for Wednesday, but we’ve just got to do it.